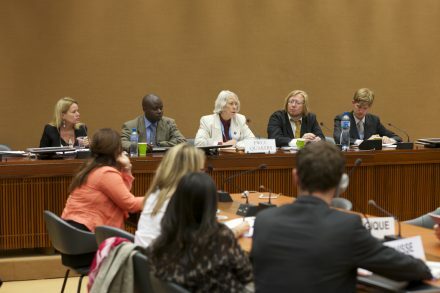 Oliver Robertson, PRI’s new manager for our Death Penalty and Alternatives project, reports from a successful panel at the 24th session of the Human Rights Council on the rights of children of parents sentenced to death. We were speaking the night before the UN Human Rights Council held a panel about the human rights of children of parents sentenced to the death penalty or executed. This was a new topic on the UN agenda and one that had not been universally welcomed when it was originally proposed towards the start of the year. We were not quite sure how it would go: whether the world’s governments would engage with the substance of the issue or whether they would avoid talking about it by saying that we should be talking about something else. Francis, who works daily with children of parents sentenced to death in Uganda, was one of the experts on the panel. And as befits an expert, he was right. The vast majority of interventions were supportive, and several were informative. Jordan’s National Centre for Human Rights works to sensitise the media so that reporting of death penalty cases is less sensationalist (referring to a parent as a ‘monster’ or describing a murder in grisly detail can be distressing) and trains teachers about these children’s needs. Norway wanted children of parents sentenced to death to be included under the UN Victims Declaration. Thailand spoke about the video visits it allows for children whose parents are imprisoned far from home and the countrywide consultations it is planning on the death penalty. Of the three more negative statements, two were nuanced, recognising the issue and stating that we could work together on some aspects of the issue. The claims in the most critical statement (by the UAE) were rebutted by a member of the Committee on the Rights of the Child who was part of the panel. To see the panel in all its glory click here for English and here for original languages (at least English, French, Spanish and Arabic). It should be noted, for people who aren’t used to the UN, that the discussion can very often seem stilted and the opportunity for genuine dialogue limited; however, this is one of the restrictions we work in and we do the best with it that we can. To make best use of the experts in town, some of the organisers held a side event (a lunchtime unofficial meeting) the following day so that we could go into the issue in more depth. To detail all the issues (whether or not they were raised in the panel), a short brochure was produced: it is available in English, French, Russian and Spanish; Arabic and Chinese are imminent. A lot of the praise for this panel must go to those who raised awareness of the issue at the UN and successfully negotiated the holding of this panel: the governments of (among others) Norway, Switzerland, Montenegro and especially Belgium, and the NGOs of Child Rights Connect’s Working Group on Children of Incarcerated Parents, chiefly the Quaker United Nations Office (disclaimer: I used to work there). But as with all of the items at the UN, talking is not enough to improve lives. To (roughly) quote Francis again, this time from his closing statement at the end of the panel: ‘It would make no use to me to come here if nothing is done: we need action’. Photographs with kind permission of Alan Kikuchi-White. This statement on the death penalty was submitted ahead of the Human Rights Council ahead of its 24th Regular Session (September 2013).